W hen Alex Zabosky was diagnosed with epilepsy in 2007, it changed his family’s life forever. Alex worried about how his 11-year old daughter, Alyssa, was affected by his epilepsy. Alyssa was only three when Alex was first diagnosed, and he was concerned that it scared Alyssa to see the seizures. However, Alex remained positive by saying, “epilepsy has taken a lot from my family, but it can never take our love for one another.” In fact, it was Alyssa who came up with the idea of a charity softball game to support her dad. 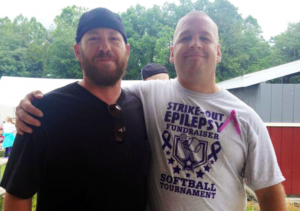 This summer, Alex hosted the first annual “Strike Out Epilepsy” charity softball tournament in Stroudsburg, Pennsylvania. The event fielded ten teams from the community along with spectators and family. Nearly 300 individuals attended the event, raising over $4,100 for the Epilepsy Foundation of Eastern Pennsylvania! Alex noted that, in addition to raising awareness and funding, the tournament brought the community together to understand the needs of their neighbors. One of the softball teams was the family of a three-year-old boy with epilepsy. Just a few weeks after the tournament, the boy needed a medevac to the hospital due to a seizure. When the firefighters and first responders arrived at the scene, they already knew the child and his condition because they had participated in the Strike-Out Epilepsy softball tournament with his family. If you’re interested in hosting your own Third-Party Fundraiser to support the Epilepsy Foundation of Eastern Pennsylvania, click here to find out more information.